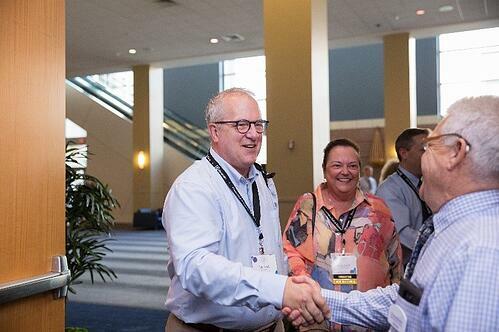 Buying a franchise business is a big decision, but so is welcoming someone into a franchise family! That’s why DreamMaker wants you to ask a lot of questions, and why we’ll ask you a lot of questions, as we explore whether we’re a great fit for one another. 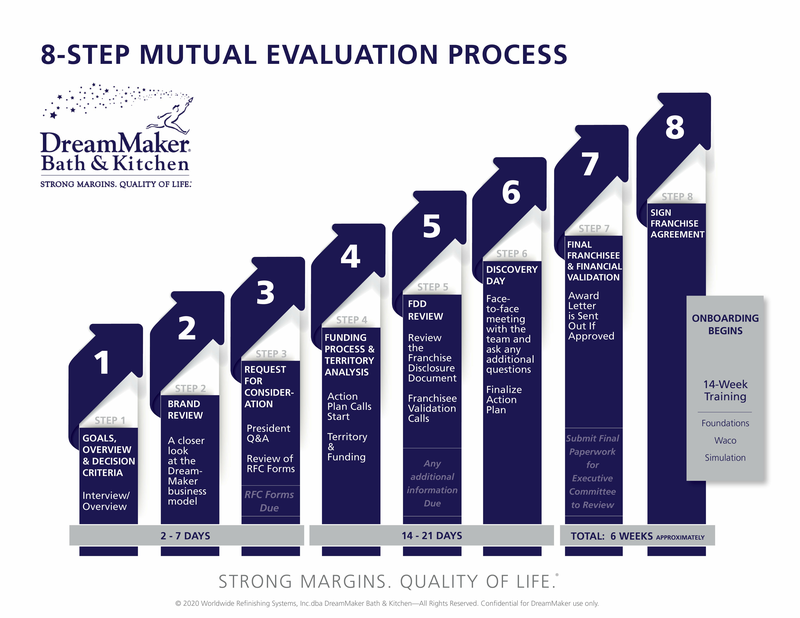 Our mutual evaluation process takes a total of about ten weeks. Once you fill out a form on our website, you'll immediately receive a flyer via email and a franchise recruiter will reach out for an initial call to discuss basics about the company. To serve and enrich peoples’ lives with dignity, excellence, humility and respect, while encouraging and inspiring others to do the same. To glorify God; in all that we do. To be faithful stewards; of all the resources entrusted to us: time, talent, treasures. This includes making a profit. To positively impact lives; to teach our principles and systems of personal and business success so that all people we touch live happier, more successful lives. What can you expect while we get to know each other? During the initial call, we ask about your business goals as well as your objective for your personal life. DreamMaker and our franchisees are in business to make a profit, and that profit has a purpose: to provide a better quality of life for you and your family. After the call, if you decide to move forward, you will be asked to fill out some of our initial qualification forms. Once you have filled out the initial qualification forms, we want you to take this time to research our company through our franchise website. DreamMaker will also host two webinars that go in-depth on the DreamMaker business model, and how it works for our franchise owners. You might have many questions during this step, and we are here to address any questions or concerns you may have. During this step, you’ll have the opportunity to go through the Franchise Disclosure Document (FDD). If you have any questions or concerns about the information provided in the FDD, we are here to assist you in any way we can. Our FDD provides contact information for our current franchisees. If you would like to hear from business owners, this is the time that we encourage you to get in touch with several different DreamMaker owners. This is an opportunity for you to get a fuller sense of what it’s like to own one of our franchises. There are specific questions they’ll be able to answer that we’re precluded from sharing — especially about the bottom line results of specific locations. During this time, you and our Franchise Recruiter, will create a plan to take the next steps to starting your own DreamMaker Bath & Kitchen, rather that be starting from the beginning or converting your existing remodeling company. If it continues to look like a good fit, you will have a conversation with DreamMaker President and Chief Stewarding Officer, Doug Dwyer. This call allows you to learn more about the business, while Doug can learn more about you. At DreamMaker, franchisees are family, and our entire franchise team is committed to helping you grow your business and achieve your goals. After getting the opportunity to speak with Doug on the phone, we would invite you to visit our company headquarters in Waco, TX. During this visit, you will meet with our team and go through an orientation. Once we have established that DreamMaker is a good fit for you and vice versa, an offer to owning a DreamMaker franchise is extended, and if chosen to accept, pre-training will begin. Want to learn more about what we have to offer once you own a DreamMaker Bath & Kitchen? Fill out the form below to gain access to our FIC Pages.